Hello everybody! My name is Lorena and I am a cat owner and cat lover as well. What can I say about me? I love traveling, snorkeling, visiting museums, watching birds and of course, I love cats but mostly I love nature and animals in general, they give you the real sense of life and caring about our planet. I am graduated as an Engineer and I love art and writing. My mind switches between the logic and the emotions, I have lived this duality since I remember, but it’s fun, it lets me enjoy the best of both worlds, but sometimes it makes it hard to make decisions. I remember when I got my first cat Lily, I rescued her from the street on a New Year’s eve. I had to start learning about cats because I didn’t have any experience previously. So I realized I needed a litter box, I needed to feed her while I was at work, I had to choose a cat food, set up her bed and so many other things. I was overwhelmed! 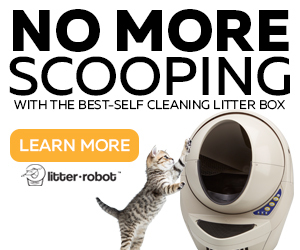 I remember the night when I needed a cat food dispenser and I started looking online. I needed good reviews that help me to decide what it was the best option, but I was very frustrated to find very little information and not very complete which made it very hard for me to get what my kitty needed. 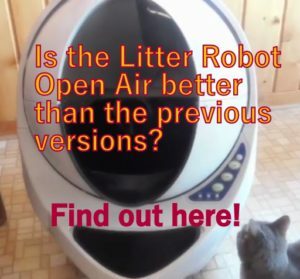 That’s why I decided to create this blog to help cat owners with complete and honest reviews about automatic feeders and I feel happy doing it. My information is written with passion and love for cats and with empathy for cat owners. 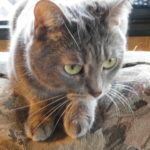 My blog is the result of almost 6 years of investigation about cats. 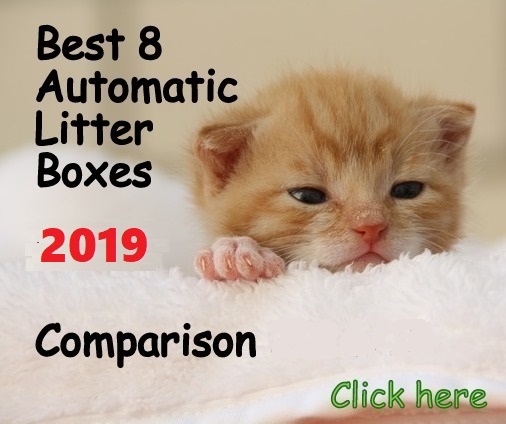 With my articles and reviews you’ll have a better idea about cat food dispensers, how they can help you to control your cat weight when you are at work, and how to analyze the current offer on the market so you can pick the best one for your cat. I didn’t know better at the time. She was my first cat and there was so much I didn’t know about cats! I felt so guilty. That’s why I was determined to investigate cat foods as much as I can to help people not to make the same mistake with their kitties. Now I have a new cat, Sophie. 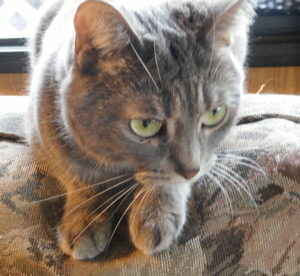 She is a little wilder than Lily, but very affectionate and cute. I love her! I rescued her from a shelter and that day I saw so many cats and I didn’t know which one to take home, my heart was broken seeing those beautiful cats wanting a home. But what made me choose Sophie is that she was the only one reaching out me with her paws through the cage trying to touch my face like saying: Please get me out of here! So I picked her. Since then, she has become a beautiful cat, very playful, curious, loving and also sometimes a little spoiled lol. 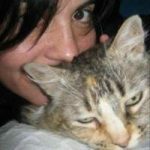 I hope you like my website, I try to make sure that you can find all the information you need to take care of your cat, I have made this website sharing my experience as a cat owner and thinking how to help, especially to new cat owners that are lost and don’t know where to start. If you have any thoughts or questions, all comments are welcome. If you need to contact me, please send me an email to contact @ catfooddispensersreviews.com I will respond as soon as possible. If you have ideas how to improve the life of kitties, just let me know and I would be very pleased to discuss it. My ultimate goal is to make kitties happy and of course kitties’s moms happy as well. You can also follow me on Twitter, Facebook, Google+, Instagram and YouTube. It was nice to meet you guys and we will be in touch! I saw your blog and was wondering if you have any advice. My dog drinks a lot of water. Unfortunately, she tends to overdrink and then throws up. I try to give her small amounts at a time, so she doesn’t overdo it. I can’t always be home to make sure she has water and I want her to always have a supply available (not continuous, but dispensed often). Do you know of anything that might work to dispense water in a timed fashion? 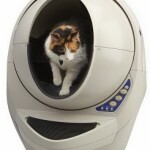 So far the closest I have found is the CatMate C50. Hello Sara, thanks for your question. The first thing it came to my mind is that maybe your dog has a reason why to drink so much water. Have you taken it to the Vet? One of the symptoms of diabetes is drinking enormous amounts of water. So my first suggestion would be to take your dog to the Vet to check its condition. And about your question, I would not recommend an automatic dish feeder to put water in the slots, they are not designed for water and most of them have the batteries compartment on the bottom. Unfortunately there is not any timed water dispenser that distributes water in portions as a feeder. 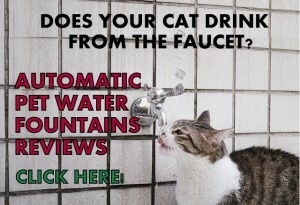 However, you can connect a timer in a water fountain as the Drinkwell for example and regulate the stream so your pet can drink along the day in less proportion. Another more extreme option is using an automatic watering drip system for plants, using one or more drippers directing to a water bowl. You can check this system and see how it might work for your dog, although I recommend much better the first option as dogs and cats need a permanent source of water during the day. Would you be interested in reviewing our cat litter mats? Hello Salina! Thanks for your question. I am planning on making reviews for cat mats. I will review your product on my website as well. The idea is having as much brands as possible so readers have all the info in one place. Thanks for your request! 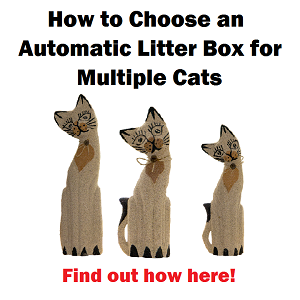 I’m about to buy an auto cat feeder, and looked at the Crown Majestic on Amazon, but its unavailable today! So, what would you recommend? We’re going on a little trip in January, and I have a pet person who can stop over as often as I want to pay for, but its $20 per visit, so I’m thinking that I would like to get him every other day, to check the feeder, clean the box, and visit my cat. So even at every other day, it’ll cost $100-120, once every day – $200-240! 1) Do you think every other day is enough? 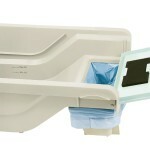 2) which feeder is the MOST reliable, and best suited to dispense 1/4 cup at 5am, and again at 5pm? Hi Fred! how long your little trip is going to be? For a cat to stay alone at home for one day will depend on your cat’s personallity. Some cats can handle very well to stay alone for one day as long as they are fed and have water with them. Some other cats not so well because they are too hyperactive or any other reason. If your cat is the type of laid-back little guy I don’t think it should have any problem, though make sure to leave him/her a scratch board or something similar this way it does not get stuck in a curtain or something like that trying to scratch it. Also it would be ideal to leave your cat with the option to watch outside through the window or glass door, this will keep it entertained for the day. Regarding feeders, when people ask me what is the most reliable automatic cat feeder I always say the Petfeedster and the Super Feeder. 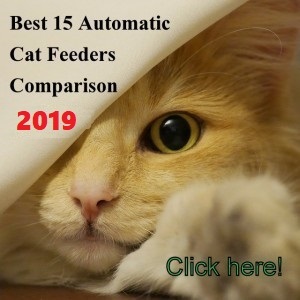 The reason for this is because even though there are other good brands and versions, I don’t take chances as I know these 2 feeders are very reliable so your cat won’t starve. If you experience power outages where you live, I recommend the Petfeedster as this feeder works with AC adapter and batteries at the same time, so if there is a power outage, this feeder will run on batteries with no problem. This is the only automatic feeder with this feature so far. The Super Feeder is very good too and if there is any power outage it will retain all the programming and as soon as the power is restored it will start dispensing normally, according to the programmed schedule. 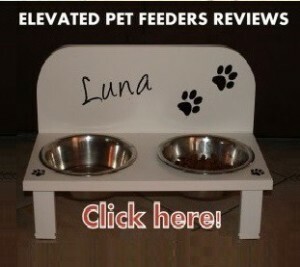 The good thing of the Super Feeder is that you can mount it on the wall so your cat cannot have access to the hopper, it will just have access to the bowl when time to eat. For this solution you have to add an extension to the bowl. You can see cool customer’s solutions here. I hope I could help you. With luck with your trip and please pet your little friend for me. Thank you for all the wonderful information here! I feel lucky to have found it. So here’s what’s up – my indoor only cat, Finn, developed food allergies, so I switched him over to Wellness TruFood (grain free). But after reading through many of your food reviews, I noticed that potato and tapioca are high glycemic and I do not want my little guy to develop any issues with diabetes down the road. Can you suggest a food that is good for sensitive systems (food allergies = grain free) that has as many of the amino acids, protein, and omega 3 (for coat and skin) that is kinda low on the glycemic index? Also, is it absolutely necessary to mix in high protein food with wet food? If so – why? Thanks, in advance, and hopefully these questions (and your answers) will help others as well. For your cat I would suggest Petcurean because they inform all 11 aminoacid in their formula and it does not have fat or carbs in the main 5 ingredients, only animal proteins. However, this fact that could be good for a healthy active cat could be bad for your cat with sensitive stomach. Because of this, a second suggestion is Halo, although they don’t mention the 11 aminoacids in their formula but, as I stated in my reviews, this does not mean the food does not contain them. Wet food is essential in any cat diet because it provides the water they need to keep the balance in their system, otherwise and specially with male cats, they develop urinary crystals. So you need to feed your cat wet food and also provide your pet plenty of water. Hope this helps! I represent Farmina Pet Foods a premium cat food manufacturer. We were founded in Italy which is where all of our US sold products are currently manufactured, exceeding EU standards, using only fresh GMO-Free ingredients. We currently distribute a Grain-Free and Low Ancestral Grain line and will soon be launching our Wet Foods. I was wondering if you would be interested in providing an unbiased review of our product. Thank you so much for your time. Yes, Josh, I would be happy to review your cat food. I periodically check on the questions/answers forum you had as of January 2017. It is now gone, why? Thanks. I’m an inventor who devised and fabricated the first feeder which able to serve wet foot to cats. 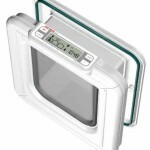 This device can serve between 10 and 30 meals in good security and hygienic conditions. I would like to have your opinion about success chances of this feeder. For the moment It’s just a prototype (perfectly functional) , and I’m seeking for companies which could be interested by a wide scale production . Should, I send you a complete file about my feeder ? Yes, I will send you my email so you can send the file. Love the info! How often should you change out little fur-balls food to prevent allergies? And I was wondering what wet food you recommend (I can’t afford more than 85 cents a can). I heard Tradet Joe’s was good? Hi Bethany, you can subscribe to my Newsletter and get my free e-book “How I feed My Cat Sophie, Tricks & Tips”. In my e-book I describe all this information, including what dry and wet food I chose to feed my cat. We see your professional articles, just wondering do you happen to think about reviewing cat toys recently? we have a great feather toy now. Thanks and good luck. I actually review cat toys. Do you have any link of your cat toy? Thanks so much for your reply, that means a lot to me. I have left a message about all the details on your facebook, would you pls kindly answer us when convenient? thanks a lot. I came across your website yesterday, and read your review on the new Orijen formula. Afterwards I sent them an email, and to my surprise they actually responded. So I wanted to send a couple of excerpts. I asked why there was a 2% drop in protein, a drop in Omega-3, an increase in Magnesium, and whether or not they use the egg shells. Here’s what they had to say on those topics. New Orijen formulas feature more meat (from 80% to 90%), more fresh meat inclusions (previously 1/2 fresh, now 2/3 fresh), and more meat variety – including using more WholePrey inclusions, so we’ve dramatically reduced the need for synthetic supplementation. For example, the previous Cat & Kitten formula had 13 supplements, and now only has 3 – nourishing cats naturally. With the increase in fresh meats the protein content did decrease slightly in the Cat & Kitten. Most of our nut nutrients do come naturally from the ingredients themselves. This is why you notice the slight changes in the Omega-3 as well as the Magnesium. You are correct that egg shells are not the best ingredient for cats, which is why we do not include the egg shell with our whole eggs. I hope this message get’s to you. Hello Danielle, Orijen old Canadian formula had 42% protein in the Guaranteed Analysis which is the real and final amount of protein. Currently, both the Kentucky and the Canadian formula have 40% protein in the Cat & Kitten food I reviewed. Regarding natural supplement, effectively they have less synthetic supplement and I mentioned this in my reviews as a PRO of the new formula. Regarding eggs, according to my investigation, in the industry of pet food the ingredient “whole eggs” means they include some shell (source). AAFCO accepts ash up to 6% out of egg ingredient on a dry matter basis, assuming it could be some eggshell in the ingredient due to the industrial process. Also, in the definition of “eggs”, there is not a requirement from AAFCO about the eggs being fresh or dried. The Company doesn’t allow big pieces of eggshell going into the food, but “eggs” ingredient might still add some ash from small pieces of shell up to 6% due to the industrial process. I’m wondering if you are interested in reviewing cat tree? Hi kiko, what type of cat tree?